Last week, a neighbor stopped me in the street and asked me if I could recommend a carpenter who could build her some custom cabinets for her sun room. I’m always a little nervous when I’m asked a question like this because it’s often followed with “… or maybe you would be interested in doing it.” But there was no hint of ulterior motive on her face so I sent her to a cabinet installer in the neighborhood. I saw her again the following day and asked her how it went. She said the guy wanted fourteen thousand bucks for the job so she was going to have to wait. I knew what she wanted and that price seemed way high to me as well, especially since he was probably going to sell her cabinets from a catalog. Basic cabinets aren’t that difficult to construct. I could have built her job from scratch in about a week. A cabinet is just a glorified box and a box is something that anyone with access to the tools and a high school shop class behind them can do. She wanted face frame cabinets which are a little trickier but still well within the skills of an amateur. Let’s walk through the construction of a face frame. And let’s make it a tough one: a bureau face frame which will accommodate three large drawers. 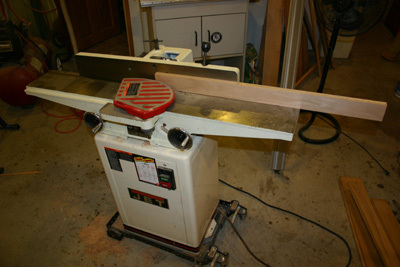 The bureau will be 44″ wide and will be constructed of red oak, most of it leftovers from other construction projects. There’s a 1×6 top rail, a 1×3 bottom rail, 1×3 stiles and 1×2 stretchers (the spacers between the drawers). 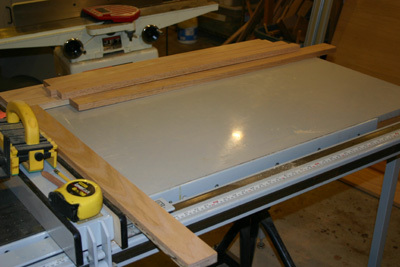 I always start a cabinet by building the face frame, then I construct the carcass to fit. That’s because the face frame ultimately defines the cabinet’s dimensions. When cutting face frame components I slightly overcut each piece in all dimensions, then edge joint them to remove any bows. Then I run them through the planer to ensure that everything fits flush. It’s surprising the differences you can find in 1-by lumber, even with lumber from the same yard. I’ve seen it vary by as much +- 1/16″. Then I remeasure, clamp the sibling pieces together inside a pair of sacrificial boards and cut them to finish size as one unit. Besides guaranteeing exactly matching lengths this prevents tear-out. Then you dry-fit the components to make sure everything plays well together. It’s where “measure twice/cut once” proves itself. The next step is preparing the face frame components for assembly. I’m a fan of pocket hole construction. The pocket hole screws ensure a tight fit as the glue dries while virtually eliminating clamping time. 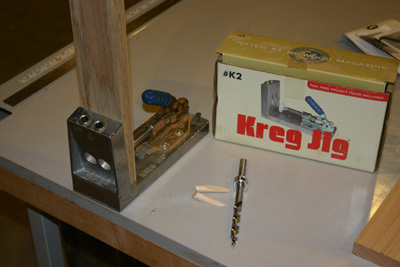 Using a Kreg jig I drilled pocket holes on the back side of the stiles and stretchers. These hold recessed, galvanized screws which are designed with a fine pitch and wide head for this application. The jig leaves you with holes like this. After you insert the screw, the hole can be plugged with a dowel but I usually don’t bother with something like this, which you can only see by pulling out the drawers and sticking your head inside. I wanted this cabinet to have some decoration so I decided to incorporate a carving on the top rail that’s sort of become the logo for this renovation. I even have one over my garage door. I’ll talk about the cool tool I used for that in another article. There’s just one final step, at least for face frames I build. I add a 3/4″W x 3/16″D half lap joint around the perimeter of the back of the face frame to provide a larger gluing area for the cabinet carcass it will be fastened to. 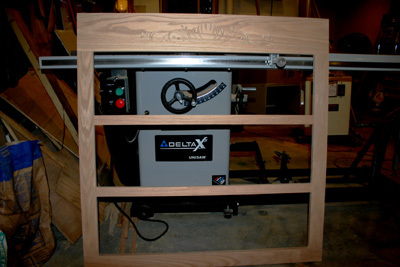 It also aids in the assembly of the cabinet by providing a recessed “pocket” for the cabinet sides to rest in, allowing you to clamp the frame both side to side and back to front. I did this with a stacked dado head on my table saw. 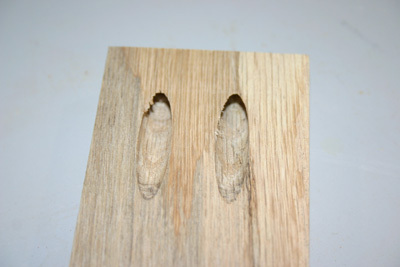 In some cases you will need to temporarily remove the pocket screws to make that cut. Finally, a little sanding through the grits (100/150/220) and it’s ready for the carcass. Total time to complete the face frame: about two hours. Here’s a picture of the completed cabinet in Glass Eye 2000, which is mocking up the stained glass panels I still need to build for the upper cabinet. 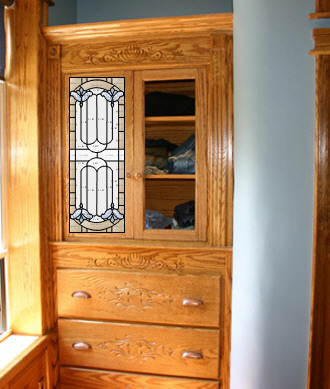 I know, I know… I’ve been talking about this stained glass project for over a year but I’m still not settled on what I want in that cabinet. I think it needs something a lot simpler. But Glass Eye is so much fun to play with it’s almost impossible for me not to go overboard with it.